Areyonga School students at Manta-manta waterhole. Areyonga School recently won the pretigious 2018 Indigenous STEM School Award. When you think of ground-breaking science education, you mightn’t think of a tiny school with only 35 students in a remote community. But Areyonga School, about 200 km west of Alice Springs in the Northern Territory, proves that you don’t have to be a big school to be innovative. Areyonga School was announced as the winner of the prestigious 2018 Indigenous STEM School Award. The school won for their two-way science program, which combines the scientific understandings and traditional ecological knowledge of the Pitjantjatjara people of Areyonga, with Western science and the Australian Science Curriculum. These activities are supported by Tangentyere Council as part of the Indigenous STEM Education Project, our partnership with BHP Foundation. A big part of two-way science is learning on Country — the students go on bush trips with Elders, ranger groups and other traditional knowledge holders. Two-way science allows students to understand their culture and the concepts of science in a hands-on environment and take ownership of their learning by asking questions. Assistant Teacher and Areyonga Elder Tarna Andrews tells the classroom teacher what she wants to teach students about, for example local plants and animals, and together they plan how they will combine that with student classroom learning. 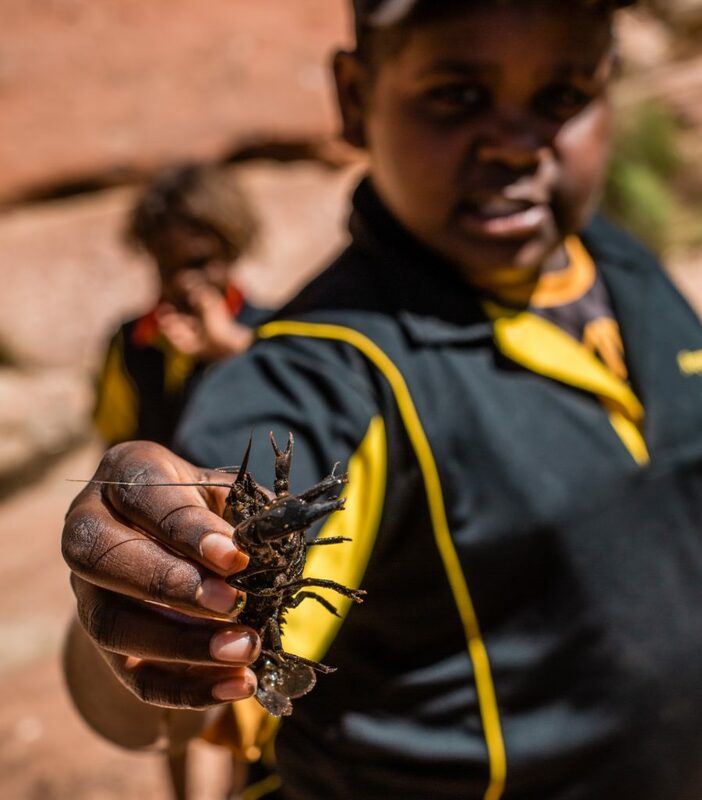 Areyonga student holding a yabby from Manta-Manta waterhole, during a science class. So what does an on Country science trip look like at an award winning school? As part of their school program, students have been recording changes in the ecological health of their local springs for the last three years. These springs, called Manta-manta, are a very important place to the Pitjantjatjara people of Areyonga. Students learn about the life cycles of waterhole animals and waterhole habitats, and make hypotheses about what animals they will find and how healthy the waterhole will be before they go out to Manta-manta. Students then walk from the school to Manta-manta, which is nestled between mountain ranges. 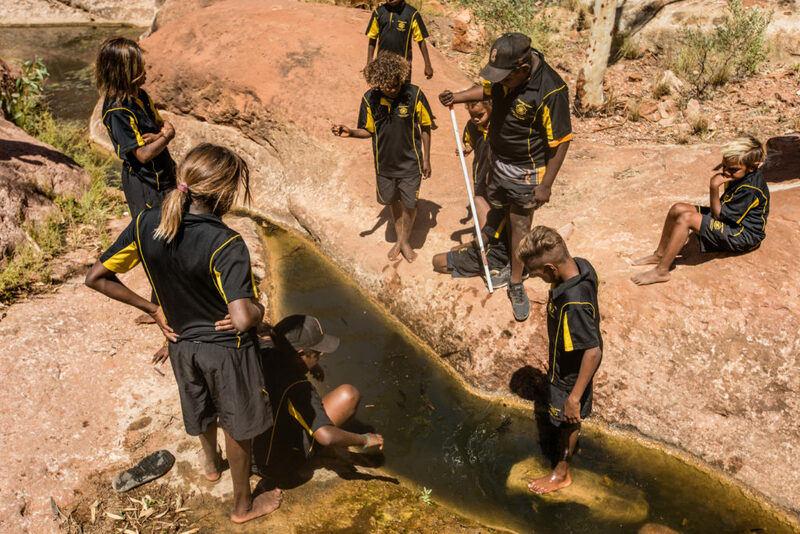 As the students gather around a cluster of tracks in the red dirt next to a spring, Assistant Teacher and Elder Tarna Andrews asks students in Pitjantjatjara what made the tracks. “These tracks belong to a dingo and these to a baby dingo,” the students answer excitedly. Students also learn the dreaming stories around the waterhole and the history of the dams that were built. Searching for water animals is the best part with students squealing in excitement as they find yabbies and fish. They’re proud to show their teachers their discoveries. Some animals like water mites and mayfly larva are very small and the students need microscopes to view them in detail. So the class uses a digital microscope plugged in to a computer, all set up right beside the waterhole. Tarna asks students about the Pitjantjatjara names of animals they’ll find such as kurtji kurtji and Nganngi (tadpole and frog). To round out the day, the students fill out a sheet identifying the creatures they found on the trip. They also learn how to understand how healthy or polluted the water is by looking at their findings and comparing their discoveries to previous trips. Why is connecting culture and science so important? 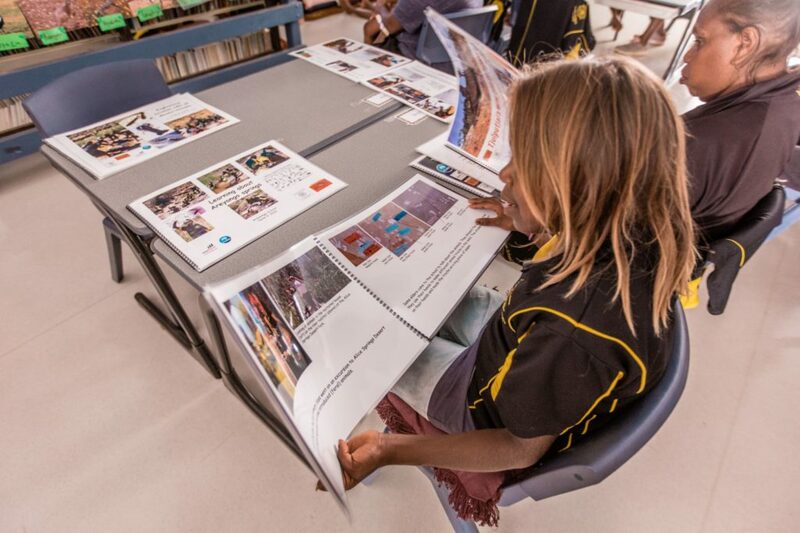 Students put together activity books after they go on bush trips with photos and information in English and Pitjantjatjara. For the students at Areyonga School, learning in their own language and English on Country is really important — it values and celebrates their culture while teaching them both traditional and Western science skills. More broadly, Aboriginal and Torres Strait Islander peoples have had advanced scientific knowledge about the world for thousands of years. This knowledge has been developed through the skills of observing, predicting, hypothesising, testing, and making conclusions. Despite this, the proportion of Indigenous students studying STEM at a university level is less than one per cent. Engaging Aboriginal and Torres Strait Islander students in science and showing that their cultural knowledge and understandings are valued in the same space is important to Australia’s future innovation. The 2018 Indigenous STEM Award winners, including Rhett Loban (back, second from right), Tui Nolan (back, far right) and Tyalah Griffin (front, second from right). The Areyonga kids only need to look at the winners of the 2018 Indigenous STEM Awards to see Aboriginal and Torres Strait Islander people combining their love of STEM and culture. The award-winners include, Rhett Loban, who has combined his love of virtual reality to develop a game based on Torres Strait Islander culture. Tui Nolan who is completing a PhD in Statistics, and has done research in Physics, Statistics and Mathematics. Then there’s Taylah Griffin who works as a graduate systems engineer at Boeing Defence Australia and is part of the Boeing Reconciliation Action Plan working team. 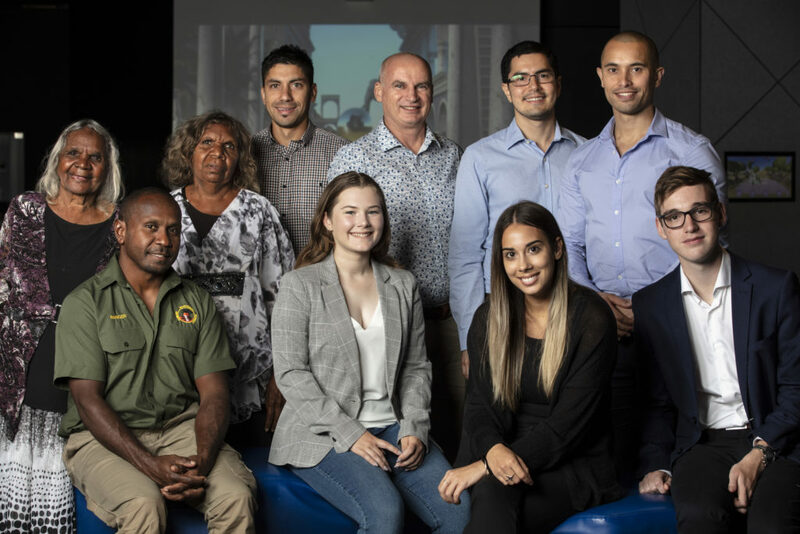 The Indigenous STEM Awards recognise, reward and celebrate the achievements of Aboriginal and Torres Strait Islander STEM professionals and students. They also recognise the integral role that schools, teachers and mentors have in supporting Aboriginal and Torres Strait Islander students in pursuing STEM education and careers. The awards are part of the Indigenous STEM Education Project, a partnership between CSIRO and BHP Foundation. Areyonga School was also recognised by the Australian Curriculum, Assessment and Reporting Authority (ACARA) as an example to other schools on how to incorporate Indigenous Knowledge into science education. A scientist, IT professional, engineer and mathematician walk into a classroom….